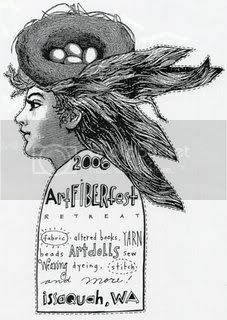 Izabella's Tattered Letters: Teesha's Artfiberfest~vendor show! Found this on Teesha's blog.... I won't be in Seattle yet, so I will miss it~(vacation to Seattle will be the week after) I would love to see the vendors night! Everyone is welcome to come to our Vendor Night at Artfiberfest on friday night June 23. Address is: Trinity Lutheran College - 4221 228th Ave. SE. Issaquah, WA 98029. It's open from 7pm-9pm. Here is our list of vendors: Fabric Frog Designs, Orange Bus Studios, Lisa Engelbrecht, Sassy Art goddess, Paper Squirrel, Darlene Veltman, Mother Rubber, Atlantian Dreams, Shades of Akasha, The Red Door Studio, Marilyn's Nouvelle Collection, Lisa Bias, Denise Marie Doll Art, Suz Simanaitis, Pam Garrison, Kate Lyon, Traci Bautista, Kari Bjorklund, DJ Pettitt, Creative Art Diner, Lampe's Lumps, Barbe St. John, Elise Peeples, Mary Stanley, Zettiology. There will be SO MUCH MORE than fiber related art and supplies...it's a rare opportunity to get to purchase from these vendors. No admisson charged.